I made this picture back in 2009, almost exactly eight years ago, on the Texas coast. It’s an early HDR that I created just as I started getting serious into photography. By early HDR standards, it’s rather tame, without the crazy colors and textures that were common of that era. I took this with the 8MP Canon 20D DSLR with a kit lens. 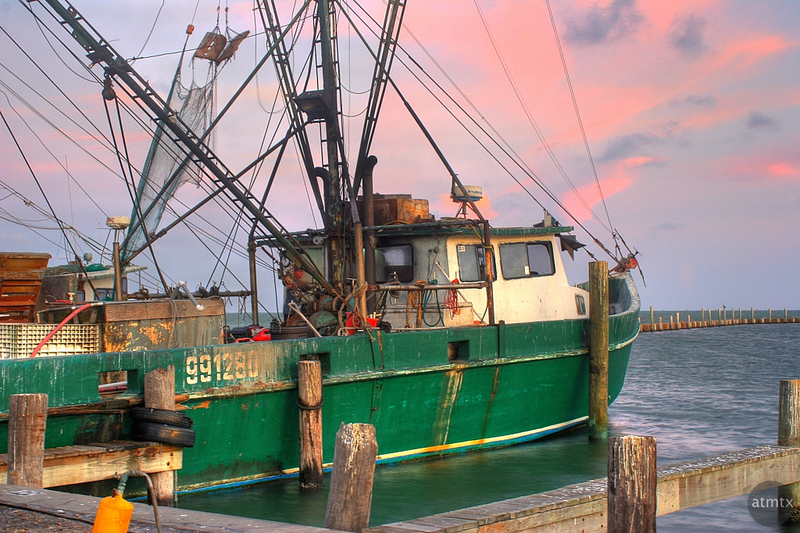 This shrimp boat is from a working fishing community of Fulton, adjacent to Rockport, Texas. Hurricane Harvey made landfall in this part of the Texas coast and devastated the area a couple of days ago with category 4 winds and water. My thoughts and best wishes goes out to the folks of the area as well as the people of Houston, who are experiencing epic floods. Luckily in Austin, we were spared the worst with 40 – 50 mile per hour wind gusts and only about 6.5 inches of rain. Crazy storm. Harvey damaged our chimney and our roof is leaking. It was raining in my living room today. Lots of other people in Texas have it so much worse. We still have our home so I won’t complain. I’m sorry to hear that, Mike. Let me know if I can help in any way. Beautiful shot. I like HDR when it’s used to even the colors across the picture and make it sharp and realistic. The wild colors and stuff from the early years just annoyed me and i used to ignore anyone working that way. It was just showy, without be artistic. I don’t mind art in photos, but out-of-control HDR is like watching a movie that is all special effects, but no plot. Thank you, Marilyn. I think I’ve always had a “relatively” light HDR touch, even during its heyday 6 – 8 years ago. Though my colors are far from subtle. I do like a rich look, even now. There was a period in HDR where everything — not yours, but most people — was so over-the-top — I hated looking at it. Blue trees and black skies and colors so hot they gave me a migraine. You always had a light touch. It’s really what got me started following you. I could look at your pictures and say “YES.” We all try to be creative when we can. I’ve been messing around with the whole line drawing and painting thing. Sometimes I love it, but sometimes not so much. It is fun to try and see what you can do. I have always enjoyed your work, from the beginning. Even when you use intense colors, you don’t make my eyeballs sizzle. Well thank you, again. You are too kind.